Warrigal Press is a internet-only secondhand bookshop, situated in Mundaring, Western Australia. Warrigal Press has been publishing since 1987, and selling new, used, antiquarian and collectable books since 2002. We have over 20,000 books in our collection. The owner of Warrigal Press, Bob Sheppard, looks at thousands of books every week. If there is a title that you are looking for and cannot find on our website, email Bob and he will keep an eye out for it. Orders can be placed by email (bobsheppard@warrigalpress.com.au) or by contacting Bob Sheppard on Phone/Fax (08) 9295 0891, or you can use the order form. Now available, The Stefano Castaways, Canon Skurla's full account of the wreck of the barque Stefano on the coast of Western Australia in 1875. Click on the above banner for more information. To order by credit card through our secure site at booksandcollectibles, please click here. To order with a cheque, cash or money order, please fill out this order form. The Golden Rule: Who found Australia's largest gold deposit? Thirty years after the announcement of the discovery of the Telfer gold mine, Bob Sheppard uncovers the real story of discovery. The Golden Rule is a story of gold and intrigue in the Great Sandy Desert. 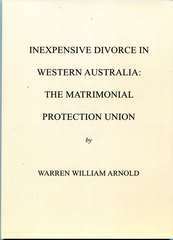 During the 1970s and 1980s Warren Arnold (who died in 1998) was a leading figure among those who were pressing for reform of the laws relating to divorce. He also set up a small business selling instruction kits, so that couples who wished to end their marriages, and were not at war with each other, could not only avoid the cost of employing lawyers, but would be more likely to remain on friendly terms if they had not been persuaded to take an adversarial approach by opposing legal representatives. This book tells his story, and includes a large number of anecdotes, (some of them very amusing) about the situations that people get themselves into, and the procedures that in many cases could help them. Warren’s account of his activities, which he decided not to publish when it was compiled in the 1980s because he feared that he might again become a target for the legal profession, has now been edited for Warrigal Press by John Melville-Jones. 67pp. 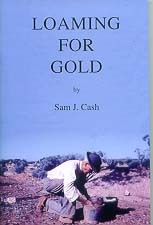 Cash, Sam J . Loaming for Gold. Hesperian Press 2008. Hesperian Press has re-released the prospecting classic which has help locate thousands of ounces of gold worth millions of dollars. Read this book and head bush to find your fortune. This is a new copy of the 76pp reprint which contains 6pp of Cash biographical information by Bob Sheppard. $22.00 plus postage. For other prospecting and mining books check out our prospecting section. Warrigal Press has for sale a number of prints from Louis de Freycinet's "Voyage autour du monde sur les corvettes Uranie et la Physicienne Histoire Naturelle: Zoologie" published in Paris, by Pillet aîné, in 1824. 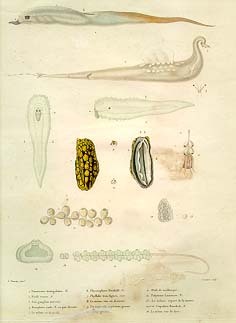 This very rare print is of molluscs and and other sea creatures recorderd and collected during Freycinet's voyage to Western Australia and beyond. The original illustration was created by Adrien Taunay 1803-1828, the son of the famous French artist Nicolas-Antoin Taunay (1755-1830). Adrien Taunay was 14 years old when he joined the Freycinet expedition. He later died while crossing the Guapore River in Brazil. The engraving has been created by Jean Louis Denis Coutant (1776 -1831), a famous French engraver. The print has stains, some repaired damage. Price is $350.00. A limited number of other other engravings are available. Email for details and prices. Check out our Cover Art & Illustrations page for more interesting illustrations and sketches. 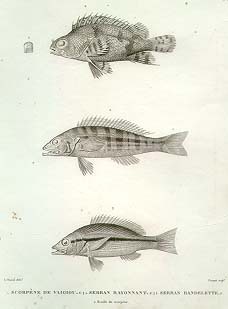 Antoine M Chazal (1793-1854) created the original illustration for this engraving of three fish recorded on Freycinet's scientific voyage. Chazal served as professeur d'iconographie des animaux at the jardin des plantes in Paris. The engraving was created by Jean Louis Coutant. The image has some dark stains. Please email for a more detailed scan. Price is $350.00. A limited number of other engravings are available. Email for details and prices. Check out our Cover Art & Illustrations page for more interesting illustrations and sketches. Horwitz Publications, Australia, 1957. This is one of the scarce and highly collectible Johnny Buchanan stories. 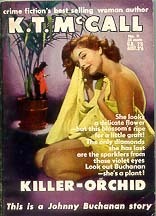 K T McCall books are the most highly prized Australian pulp novels. This is a scarce copy in good condition. Light wear to the spine. $250.00 plus postage For more great Oz Pulp, check out our Other Pulp Fiction section. Segal, Harvey Gordon. Kosrae the Sleeping Lady Awakes. 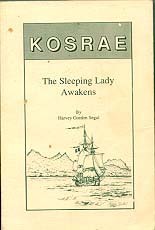 The history of Kosrae, one of the Micronesian Islands. This scarce 382 pp history covers topics such as volcanic origin, Lelu, Chiefs and Titles, the Old Gods, traditions, foreign discoverers, French explorers etc. Numerous b/w illus. Index. The wraps have some light soiling. Binding is good. Price reduced to $80.00 plus postage For other great books on various topics check out our Something Different section. MacDonnell, J E. The Reluctant Assassin. London: Horwitz Publications, 1970. First Edition. 12mo - over 6¾" - 7¾" tall. Mass Market Paperback. Good First edition of this scarce Mark Hood series title. Covers worn, slight roll. Edgeworn. 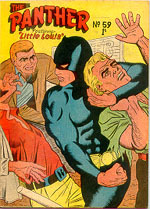 Old price label on front cover ( small ). A few light pen marks on rear cover. Email for a scan and more information. $200.00 AUD plus postage For other great J E MacDonnell books, check out our J E MacDonnell section. Wheelahan, Paul. The Panther No 59. Sydney: Youngs Merchandising, Comic. Good Near very good copy. Very scarce work by the famous Australian illustrator, Paul Wheelahan. $77.00 AUD plus postage For other great comics, check out our Comics section. Strange Experience for Men Vol 1 No 3. NSW, Australia: Gredown Pty, Magazine. Good Great collectible Men's mag. Great gals and illustrations. Light wear. A few fold marks. Email for details. $30.00 AUD plus postage For other great magazines, visit our Magazines section. Bonham, Frank. The Texan Buys a Gun Bride. 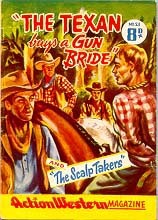 Action Western Magazine No 23 published by John Edwards Company Sydney. Circa 1950s. Scarce western pulp in good condition with light chipping around the edges. 12mo. $44.00 AUD plus postage For other great westerns, check out our Westerns section. Warrigal Press has a cover art, comic art and original illustration gallery. Take a look at the fabulous illustration of the cover of Lawrence Cortesi's Mission Incredible and Walter Tyrer's Sexton Blake Thriller The Case of the Conscript Miner. Also, Rob Phipps' Shanna the She Devil and Rulah and Sheena battling it out in a humorous cover for Wierd Jungle Tales. Warrigal Press has also secured a number of illustrations by Newton Burcham, Carl Lyon, Norm Mitchell and others plus signed prints by Jim Steranko, Al Williamson and Michael Kaluta. Check out our growing gallery of valuable artworks for sale. Thanks to Robert, a Marshall Grover enthusiast, Warrigal Press has created a list of Marshall Grover books. Click on the above banner for the list.